How To Earn $1 Billion Dollars — A fun article by Chris D. that shows how with enough time, anyone with a modest savings can compound their way to a cool billion dollars. Earning 2x On SBUX — In this video, AK goes over one of his recent options trades that doubled in just over 2 weeks. Apple Earnings Review — AK reviews earnings for one of our Macro Ops target companies. Facebook’s Comeback — AK takes a look at how Facebook (one our Macro Ops holdings) is turning things around in 2019. Morgan Housel put out a great writeup titled Origins of Greed and Fear on how both play a critical — and often detrimental — role in our decision-making process. Dostoevsky once said that “Lying to ourselves is more deeply ingrained than lying to others” and Morgan lays out in this piece just why this is. Here’s an excerpt and the link. But if you overestimate how much of your previous outcomes were caused by identified actions that were in your control, then doubling down on what happened to work before increases the odds of future failure. Greed happens when you overestimate how influential your past actions were on outcomes, enticing you to keep pushing right up to, and beyond, the point of eventual regret. Some great Investor Letters have hit the wires in the last two weeks. Scott Miller of Greenhaven Road Capital put out his Q4 letter that has some interesting pitches for buying KKR and BXC and is definitely worth a read. Here’s the link. Fred Liu of Hayden Capital also shared his letter (here’s the link). Fred’s letters are always some of my favorite reads as he has interesting discussions on investing theory and market trends. In this one, he talks about rising customer acquisition costs (CAC) and how that’s driving the trend of companies diversifying away from their core business models in order to steal more of their customer’s attention. Here’s a cut from the piece. Within an industry’s profit pools, value typically accrues to the company controlling the scarce resource (i.e. where the bottleneck is). With distribution methods and shelf space increasing, the “bottleneck” has shifted to the next scarce resource: customer’s attention and time. Last year, Netflix’s CEO even claimed its competition isn’t other video streaming platforms – it’s other uses of your time like sleep. Concurrent with this, companies like Amazon figured out a decade ago, that by aggregating consumers and making them happy (versus finding ways to squeeze every last dollar out of them), they could control this scarce resource, and at the same time grow to unprecedented levels. This is because the ultimate limitation on a company’s size and degree of control over an industry, was and still is, anti-trust (i.e. monopoly) regulations. He also makes a compelling bull pitch for the online car order/delivery company, Carvana (CVNA). Give it a read. The following chart is via @ukarlewitz. 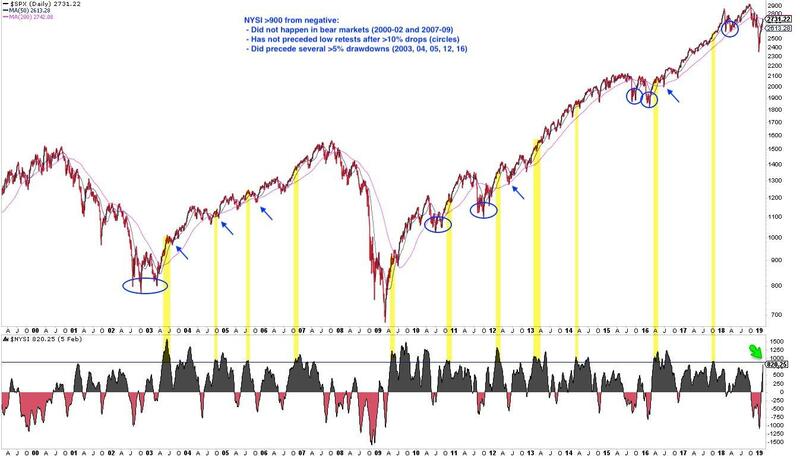 It’s of the NYSE McClellan Summation Index which is an indicator of breadth for the overall market. The chart shows that the index is about to cross +900 in the next few days after being deeply negative at the end of last year. Urban Carmel notes on the chart in yellow the other instances where this has happened. Each point marked a significant bottom. Strong market breadth means there’s a lot of participation in this rally. It’s an essential ingredient to producing a sustainable bullish thrust. And all the indicators of breadth that we look at (including those for the HY bond market) are showing incredible strength. This tells me that the bottom is likely in on this move and though the market is technically stretched on a short-term basis and we should expect some kind of a pullback here, the path of least resistance is still higher (for US stocks at least). 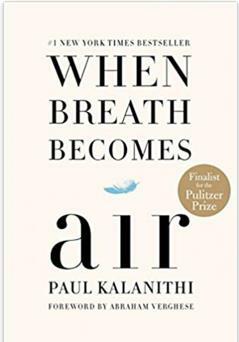 While flying back from Puerto Rico this week, I devoured the book When Breath Becomes Air by Paul Kalanithi. This book is incredibly beautiful… My eyes welled up with tears while turning its pages. The late author had an incredible gift for words and strikes home at some deep truths about life, death, and finding meaning in it all. The secret is to know that the deck is stacked, that you will lose, that your hands or judgment will slip, and yet still struggle to win for your patients. You can’t ever reach perfection, but you can believe in an asymptote toward which you are ceaselessly striving. Lucy and I both felt that life wasn’t about avoiding suffering. Years ago, it had occurred to me that Darwin and Nietzsche agreed on one thing: the defining characteristic of the organism is striving. Describing life otherwise was like painting a tiger without stripes. After so many years of living with death, I’d come to understand that the easiest death wasn’t necessarily the best. Because I think this book is such an important read I want to gift it to our Collective members. If your part of the Collective then just shoot us an email with your name and mailing address and we’ll get a copy sent out to you. Uranium stocks continue to set up well. 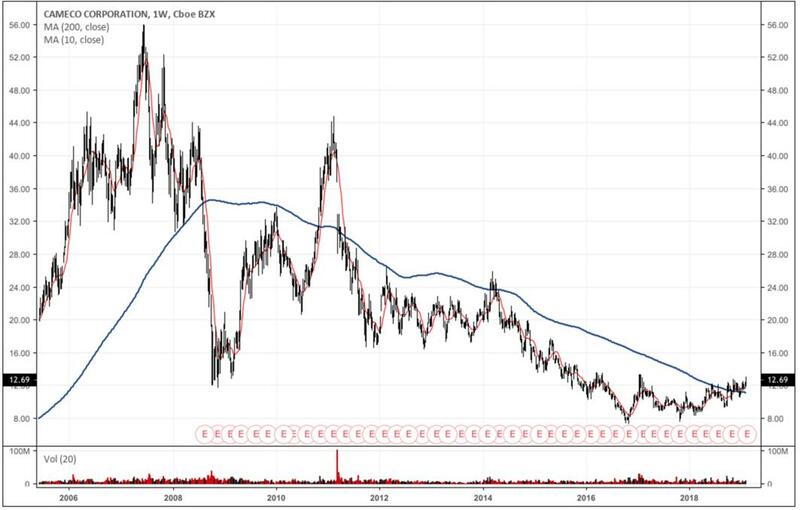 Below is a chart of Cameco Corp (CCJ) showing the stock has put in what looks like a textbook bottoming formation and is now trading above its 200-week moving average. I don’t know when the next uranium bull market will start in earnest. But, the fundamental backdrop makes the risk-reward picture so good here that it makes sense to have continuing exposure to the space, as long as the technical picture remains strong. There’s a lot to the fundamental uranium bull story. But ultimately, uranium, like all commodities, follows the capital cycle. This is where periods of high capex leads to oversupply and a bust followed by periods of low capex which leads to low supply and then a boom. 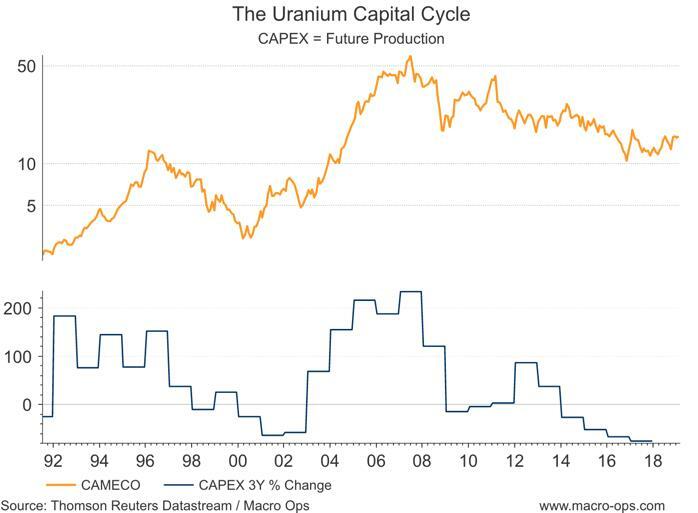 The chart below shows that uranium miner capex is, and has been, at an all-time low for a considerable amount of time. This is similar to holding a beach ball under water. It’s now just a matter of when will the downward pressure be removed and the market spike similar to 02’.